Have you ever heard the phrase "happiness is sleeping"? In this unique analysis, I have tried to quantify the effect that sleep has on my happiness. The results are very interesting. Sleep deprivation definitely seems to influence the lower limits of my happiness ratings. It can be summarised like this: being sleep deprived does not mean I will become less happy, it means that I may become less happy. That's a highly valuable fact to be aware of. This chart here shows the results of this analysis about happiness and sleep. This article covers exactly how I got to create this chart. What am I looking to find out? When did I start tracking my sleep? Why I started tracking my sleep? What data did I collect? Tiredness merely a function of sleep duration? Positive correlation between sleep and happiness? Does more sleep result in more happiness? It is widely known that sleep influences our happiness. Many studies have shown that a continued lack of sleep (sleep deprivation) has negative results on not only the ability to be happy but also the immune system, brain functioning and blood pressure levels. It cannot be argued that sleep is one of the most important factors in our lives. If we don't sleep well, we are likely unable to function properly. Yet, a lot of people don't pay attention to their sleep habits. In March 2015, I took the decision to focus more on what my sleep habits were. I started tracking my sleep. Since then, I have recorded nearly 1.000 days of sleep. I want to show you exactly what sleep does for me, and how it influences my happiness. Is there a positive correlation between my sleep and happiness? Let me rephrase that: Am I happier when I have more sleep? In addition, I want to find out how much sleep I need in order to maintain my happiness. What minimum level of sleep do I require before it starts to affect me? This site is all about tracking happiness. I track my happiness and want to inspire others to do the same by showing the benefits and results that I've gathered over the years. In addition to tracking my happiness, I have also been tracking my sleep. This is a bit different than tracking my happiness. There are multiple methods a person can use to track their sleep. I know of people that do it by hand, in a bullet journal or a simple notebook. I myself like to do things digitally. Therefore, I have been using an app on my smartphone for sleep tracking. This app - Sleep as Android - is great. 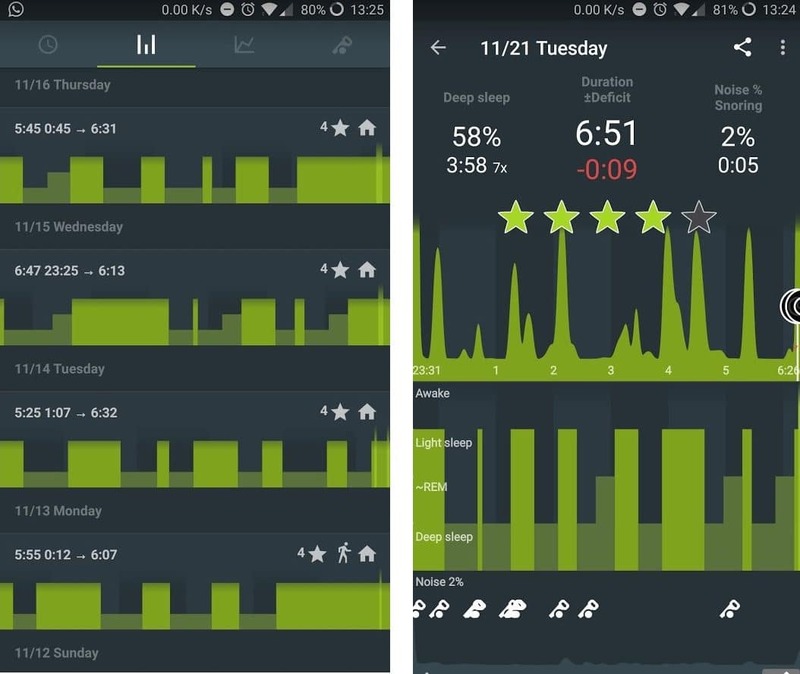 There are multiple apps out there that can track sleep, but I have not come across one with the ease of use and great features this has. This app starts measuring my sleep once I turn it on every night. It not only tracks the start and end time but also tracks the movement and sounds of my (mis)adventures in dreamland. You can only imagine what kind of data this results in! I have only used a part of this data in this first analysis. I'll get to the data later. At the start of 2015, I spent a 5 week period working on a huge project in Kuwait. It was a very challenging period for me, and my happiness ratings were quite low at the time. I experienced one of my worst days ever during this time. I won't blame you if this thought came to your mind. 5 weeks isn't really that long of a period. Yet, I still managed to get completely burned out at work due to a complete lack of sleep. You see, I worked about 80 hours a week. After 12 hour days on the project, I felt like I still wanted to do things I actually liked and enjoyed. So instead of going to bed at a decent time, I watched movies, exercised and Skyped with my girlfriend until late in the night. Even though my alarm went at 6:00 AM every single morning, I rarely went to bed before midnight. I was living on about 5 hours of sleep per day, while continuously working LONG days. These 5 short weeks lasted a lifetime. It was a difficult period, purely because I completely mismanaged my sleep duration on a daily basis. This period would have been a lot easier had I focused more on my sleep. I also knew I was going to spend more time on challenging projects abroad in the future, so I wanted to be fully prepared when the time came. I started to sleep with my smartphone next to my pillow, constantly collecting data about my sleep habits. So after having tracked my happiness before going to bed, I would turn on this app, and let it run in the background. Sleep as Android collected all my sounds and movements, which were simultaneously backed up to the cloud for future reference. After waking up the next morning, I stopped the app from tracking and rated the way I was feeling. Easy stuff! This obviously results in a lot of data, which is extremely interesting to analyse. However, I will only use the start and end time of my sleep for this first part in the "Happiness Essay on Sleep" series. No matter what this analysis determines, there will be lots of additional possibilities for me to further analyse this set of data! Let's not waste any more time on this intro, and look at the shiny data this app has collected for me. I am only interested in my daily amount of sleep for now. This is quite easy for me to calculate, as the application can export every recorded sequence of sleep to a single file. The only thing left for me to do now is to sum the duration of all sequences per day. It is possible that a single day contains more than one sleep sequence (think of a power nap). An important detail here is that I've counted the duration based on the end date of the sleep sequence. Say, I slept from 23:00 on Friday, until 6:00 on Saturday, then the total duration of 7 hours will be counted for Saturday. Before showing you the complete set of durations, I first want to zoom in on a smaller interval. The chart below shows the daily sleep durations for the months November and December 2016. There are a few things I want to highlight here. It's immediately clear to me that I sleep below average on weekdays (Monday to Friday) and above average during the weekends (Saturday and Sunday). Also, the average amount of sleep within this interval is 7,31 hours. According to the National Sleep Foundation, that is an acceptable amount for the majority of the adult population. Now, I'm going to make a huge assumption here. I'm assuming that my average sleep duration is equal to my minimum required sleep. Yes, let that sink in. I make that bold assumption based on the following lines of thinking: I have been a functioning human being, and have lived a happy life so far. I've experienced my fair share of sleep-deprived days, in which my happiness was definitely influenced (my period in Kuwait springs to mind). However, I have always recovered from those periods by catching up on sleep. This is included in the average sleep duration. You could say that I might be sleeping too much and that I can still be a functioning and happy human being on less sleep. To that I say: you might be right, and that I simply don't know. It's one of the things I want to determine by analysing this entire set of data. I want to find out what minimum level of sleep I require before it starts to affect me. Anyway, based on the prior assumption of required sleep duration = average sleep duration, I am now able to calculate my sleep deprivation. According to Wikipedia, sleep deprivation is the condition of not having enough sleep. I can calculate my daily sleep deprivation by subtracting my daily sleep duration from my required sleep. This sleep deprivation is visualised in the chart below. It's important to point out that a positive value in this chart is actually a good thing. The chart shows a positive value if I slept longer than required, and a negative value when I'm sleep deprived. I've added the cumulative sleep deprivation and charted it on the right axis. This shows you exactly what my sleep habits are. I tend to not sleep enough during weekdays, from which I need to recover on the weekdays. This matches my suspicion: I highly value my sleep on the weekends. Waking up early gets harder as the week progresses, and I'm usually pretty tired on Fridays. My sleep habits would certainly not win any awards for Best Value or Most Durable. No way. You know now that my sleeping habits are not optimal, and I'm very much aware of it. By shifting my sleeping times like this, I am constantly living on a jet lag. This is called a social jet lag. This is certainly something I should be trying to optimise. One more thing I want to highlight before showing you my full set of data is that the cumulative sleep deprivation ends exactly on zero. This is a result of my big assumption, that my required sleep duration equals my average sleep duration. Except for a couple of periods, I have been living with a social jetlag for the entire duration of this analysis. The pattern is mostly the same: sleep deprivation during the weekdays, and recovery during the weekends. How can an article about tracking sleep - posted on a site about tracking happiness - have gaps in the data?!! There are a couple of reasons for that, of which one is that I simply forgot to start this sleep tracking application before going to sleep on some days. No excuses there! This results in the small, single day gaps you see in the data. What caused the bigger gaps in this data set were my holidays. During some of these holidays, I was sleeping in a tent without the possibility to simultaneously charge my smartphone and track my sleep. I personally think that's a good enough reason, so I would appreciate it if you could forgive me for these errors. These gaps are discounted in this analysis, meaning that they do not influence the outcome of this exercise. The average sleep duration on which I have survived and functioned just fine so far is 7,16 hours per day. Let's see how this translates into my sleep deprivation calculation! As you can see, the cumulative sleep deprivation varies quite a lot. The periods with the steepest increases and decreases in cumulative sleep deprivation deserve some additional context. For example, have a look at the Christmas period of 2015, starting on the 20th of December. At the time, I had a 10-day streak of great nights of sleep, lasting until the 31st of December. This was the result of the holiday period, during which I rapidly increased my sleep buffer! Another example is a streak of sleep-deprived days, starting on the 3rd of July, 2017. This was actually the start of a very busy period at work, from which I only fully recovered two months later during my holiday to Norway. For more details on the different things that were going on in my life during this entire period, you can check out my 'Personal Happiness Journal' section. It covers every single month of my life. You might be interested to see a quick visualization of my average sleep duration per day. It's safe to say that there's some room for improvement here. As of right now, I rely on every single weekend in order to catch up on lost sleep. It'd be much better if I could manage to evenly distribute my sleep, without depending on a particular day of the week. I must confess something. This data is nowhere near 100% accurate, and it would be naive to think otherwise. Allow me to explain. For example, the 21st of May, 2015 looks to have been a terrible night for me. If you have a look at the chart, you will see that I had a sleep deprivation of 5,73 hours that night! Only 1,43 hours of sleep? What the hell happened there? Well, I was actually traveling to Costa Rica on that day. Therefore, I not only faced a huge jetlag and difference in time zones, I also didn't activate my sleep tracking app while dozing off in my seat on my long flight. Coincidentally, the 7th of April, 2016 has the exact same issue. On that day, I was flying back to the Netherlands, from a second visit to the same project in Costa Rica. I also need to point out that my data is inaccurate due to yet another reason. That reason is: I don't instantly fall asleep the moment I press start on my sleep tracking app. If only that was a possibility, right?! I fall asleep quite easily. It usually doesn't take me more than 30 minutes. I can confidently say that because I always sleep with music on, and I set my MP3 player to shut down after 30 minutes of inactivity. 99% of the times, I don't notice it when the music stops, meaning I'm already flying with dragons, exploring beautiful forests and fighting off villains in my imaginary dreamworld! 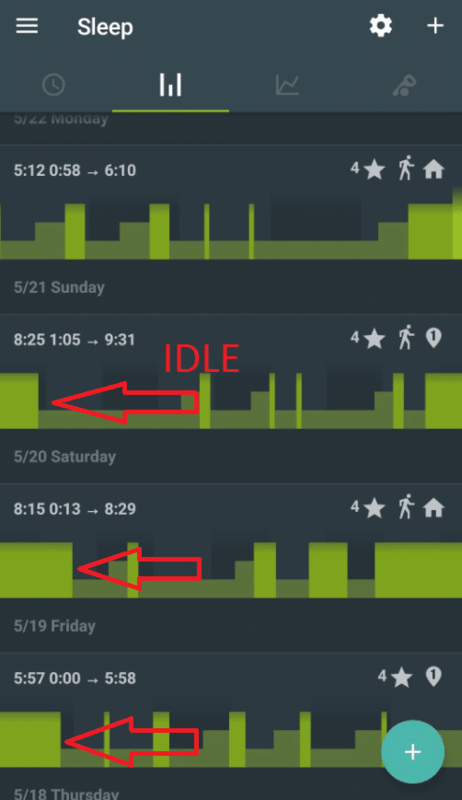 A number of sleep sequences, highlighting the durations at the start of my sleep laying "Idle"
These "idle" times - a.k.a. the moments when my app is measuring my sleep but I'm actually still awake - are somewhat distorting this data analysis. I can only hope this doesn't ruin my data beyond any use. We'll have to see about that! In addition to tracking my sleep data, I've also been tracking my happiness. If I want to determine whether or not my happiness is influenced by my sleep, I'm going to have to combine these two sets of data. The chart below shows you the same set of data as before but now includes the happiness ratings as well. Please notice that these ratings are charted on the right axis. So this chart shows you 3 things: my daily sleep deprivation, my cumulative sleep deprivation and my happiness ratings. I have tried to include some comments here and there. It's my attempt to provide extra information to this chart since it's rather hard to read as it is. Can you determine whether or not I'm happier during the days where I have slept like a baby? You should be able to see big dips in my happiness ratings. These were never caused by a lack of sleep though. Similarly, my happiest days were not caused by an abundance of sleep. It's impossible to determine any correlation at all based on this graph. I know my happiness is influenced by a lot of factors, but so far I cannot tell if sleep is one of them. In addition to my happiness ratings, I have also tracked my happiness factors. These are factors that influence my happiness and could be virtually anything. If I enjoy a great day with my girlfriend, then my relationship will be counted as a positive happiness factor. If I feel sick, then this will logically be counted as a negative happiness factor. You get the idea. My happiness tracking journal is filled with both positive and negative happiness factors. One of the negative factors that frequents my happiness tracking journal is being "Tired". I use this happiness factor whenever I feel tired, and when it affects my happiness. Maybe you know the feeling: you wake up feeling miserable and have trouble staying awake throughout the day. No healthy amount of coffee can help you here, and your temper is only a fraction of what it usually is. Well, the negative happiness factor "Tired" is perfect for days like these. My worst day ever in Kuwait is a perfect example of this negative happiness factor. The chart below is the same as before, but is now further populated with the 7-day count of the happiness factor "Tired". This chart shows you 3 things: my cumulative sleep deprivation, my happiness ratings and the 7-day count of the "Tired" happiness factor. This line counts the number of times the negative happiness factor "Tired" occurs. This count is plotted as a negative value. So far, I have never used a positive happiness factor to describe the way I feel when I'm actually well rested. Therefore, the happiness factor that is related to my sleep can only be correlated to the days in which my happiness rating was negatively influenced. If I may ask again: can you determine whether or not I'm less happy when I feel tired? So far, these two combined data sets don't result in clear conclusions. I have to dig deeper. Some of these results don't even make sense within this data set. Notice that from the 17th of January, 2016, I managed to lose a sleep buffer of 10 hours within a couple of days. Yet, I still didn't feel tired enough to actually determine it as a negative happiness factor. The count remains zero. Also, on the 25th of September, 2017, I certainly had plenty of sleep. Yet, my happiness was still negatively influenced by the factor "Tired". I apparently felt very tired, despite sleeping more than enough. This makes me wonder: is the feeling of tiredness only influenced by sleep duration, or is it a function of multiple factors? I get the feeling that many other factors are playing a role here. Just think of sleep quality, social jetlag, nutrition and workload during the day. These factors could all influence my feeling of tiredness and are obviously not included in this analysis. I definitely see some opportunities to further analyse this data, which I'll further explain near the end of this article! Is there a positive correlation between my sleep and happiness? Am I happier when I sleep more? Let's start with the simplest of all charts. The chart below shows the happiness ratings plotted against the daily sleep duration. This combination of simple happiness and sleep data may already provide a lot of information. This chart includes every single day of data that we've previously discussed. To be honest, these results do not answer my question at all. As far as correlations go, there really isn't one. The trendline is basically flat, which indicates that the correlation is close to zero (it's actually 0,02). It seems that my happiness is not influenced by my daily amount of sleep. Have a look at my worst days. There are four days that I've rated with a 3,0 within this dataset. I had below average sleep on only one of those days. The other three days were just as terrible, as they have gotten exactly the same happiness rating. Yet, I had plenty of sleep the night before according to this data. No results here. Let's continue with the next scatter. The chart below shows the happiness ratings plotted against the cumulative sleep deprivation. Please note again, that a negative value indicates a lack of sleep here. Why do I present this graph? I think sleep is a difficult beast to analyse. It's clear that my daily sleep duration does not have a big impact on my direct happiness. But what if the effect is lagging? What if sleep deprivation only affects my happiness when it is continued over a long time? The previous chart already shows the sleep and happiness are not really correlated to each other on a per-day basis. Imagine this: I'm experiencing a very busy period, and therefore have a long streak of terrible nights. My cumulative sleep deprivation quickly builds up to huge levels. I'm lacking 20 hours of sleep at this point. If I then finally catch a break and sleep for 9 hours, I decrease that sleep deprivation to about 18 hours. If you look only at my daily sleep data, I am very well rested and have slept 2 hours longer than my minimum required duration. However, my cumulative data tells me I'm still lacking 18 hours of sleep. That's exactly what happened on the 3rd of July, 2017. I had a big streak of crappy nights, and my cumulative sleep deprivation was quickly getting worse. On the 15th of July - 12 days later - I finally had the opportunity to catch up on some sleep and slept for 10 hours straight. But it was too late. I got sick and felt extremely tired that day, and it was all because I let my cumulative sleep deprivation get out of hand. One good night of sleep was never going to fix that. The correlation between my happiness ratings and cumulative sleep deprivation is still very small (it's 0,06). Yet, this chart definitely makes more sense to me. If you have a look at my 4 worst days ever again, you can see that they actually all happened during a period of sleep deprivation! The worst of them (the data point in the lower left) happened on the 4th of September, 2017. Not only was I extremely sleep deprived (-29,16 hours), I also got sick and had an infected wound after a nasty wisdom tooth removal. I'm not saying these events are all directly related to my cumulative sleep deprivation. But it's no coincidence either that all my worst days happened on a big lack of sleep. You can also see that my happiness ratings have not gone below a 5,0 on days with no cumulative lack of sleep. Again, I'm not saying this is purely the result of my sleep duration. I'm only trying to observe the results here. It seems that my happiness ratings are at the very least affected by my continued lack of sleep. A big amount of sleep deprivation seems to expose me to lower happiness ratings. This makes perfect sense to me. Sleep deprivation not only directly influences happiness, but it also influences your blood pressure, brain functioning, and immune system. These are all quite critical factors, that could each have an additional effect on happiness. There's no way for me to test the exact effect of sleep on happiness, because my happiness ratings are much more prominently influenced by other factors, such as my relationship or my expenses. If you're interested, I've answered the question "can money buy happiness" in another happiness essay. There's is also a big dilemma regarding sleep and happiness, which further challenges this analysis. I will get to that later. Let's continue to the next scatter chart for now. The chart below shows the happiness ratings plotted against the moving 28-day sleep deprivation. Instead of showing the total cumulative sleep deprivation, this chart only focusses on a 28-day sleep deprivation. This means that each happiness rating is plotted against the summed sleep deprivation of the past 4 weeks. You may wonder why I present you this graph? Isn't it practically the same as the previous graph? Well, I think this one is better. Some studies on sleep claim that sleep deprivation does not expire. For example, if you are sleep deprived, you cannot undo it just by returning to an average sleep duration. You actually need to make up for all the hours of sleep that you've lost. That's what they say, at least. But I don't want that. I don't want the sleep deprivation of the 13th of September, 2015 to influence my sleep deprivation of that same day 2 years later. I agree that sleep deprivation doesn't expire if you're not catching up on lost sleep, but I am not in complete agreement with the extent of this statement. It's not like I still feel tired from my 3-year-old sleep deprivation. I don't want data to have an everlasting effect on this analysis. At some point, the influence wears off. By using the moving 28-day sleep deprivation, the correlation here slightly increases from 0,06 to 0,09. As I started this article, I want to know whether I am happier when I have more sleep. The charts that I've shown you so far have not resulted in a clear answer. Sleep and happiness are two concepts that are quite difficult to compare. I want to show you one more thing, though. The chart below is exactly the same as the previous one, but I added two basic lines to identify the upper and lower limits of this data. There are two things I want to highlight here. Within this data range, I have only been truly unhappy when I was sleep deprived. I have not been unhappy - happiness rating lower than a 6,0 - on days where I have had a sleep buffer of 10 hours or more. Despite the negligible correlation, I do seem to be affected by my sleep deprivation. It looks like being sleep deprived opens the door towards unhappiness. It's impossible to determine whether this unhappiness is a direct or indirect result of sleep deprivation. This is why an analysis like this is extremely hard, especially when only looking at the quantity of sleep. You can probably imagine an endless list of factors that could also influence my happiness. All these factors are distorting this analysis. My goal is to find the factors with the highest influence on my happiness, and that is what the Happiness Essays are for. According to this analysis, the answer is no. I have not been able to determine how much an extra hour of sleep influences my happiness. There is simply too much noise in the data. However, my sleep deprivation definitely seems to influence the lower limits of my happiness ratings. We all want to be as happy as possible. And sleep is known to have an influence on our happiness. But there's a certain dilemma here. We become and stay happy by being awake, doing things we enjoy doing. Therefore, it's safe to say that our happiness ratings can only increase when we are awake. You see where this is going? You may decide to sacrifice your sleep for the sake of spending more time on things you like. That's what I have certainly done in the past. I did it rather successfully while traveling in New Zealand: I chose to temporarily reduce my sleep duration because I wanted to travel more. I also spectacularly failed in this regard, when I had my worst day ever while burning out in Kuwait. Somewhere between these two examples lies an optimum. And we should all try to pursue this optimum. We all want to stay awake as long as possible, to enjoy the things we enjoy doing. But we don't want to shoot ourselves in the foot by becoming seriously sleep deprived. And that is the dilemma of sleep and happiness. This kind of self-awareness is perhaps the biggest personal benefit of tracking happiness and analyzing my sleep data like this. Knowing about this dilemma allows me to always make calculated decisions when faced with these kinds of choices. So far, I have only looked at the quantity of my sleep. I have not yet looked at the quality of sleep. This opens up the possibility for me to further analyse this data, which I will do in additional parts to this series of posts. I also want to eventually complete a case study, in which I will sleep only 4 hours per night for an entire month while living my normal, regular life. How would this affect my happiness? It might be very interesting to see what happens. What is your opinion on sleep? What are your sleep habits like? How do you feel about the sleep and happiness dilemma? I would love to know! If you have any questions about anything, please let me know in the comments below, and I’ll be happy to answer! Sounds great! Will follow-up with you once it’s done. I’d love to translate your post to Spanish and post it on my blog http://www.proyectodescansar.com. I’d explicitly state that the content below is a translation and that it belongs to you. As Mr. @Martin has mentioned already but I would love to see your source code if possible. And I know it includes private data of yours, but it could be nice if I could also use your dataset to analyze the cause of human’s happiness/QOL. I know it is a difficult requirement so feel free to refuse me. Thanks for commenting! 🙂 If you want, I can send you the sheet that parses the exported data from the SleepasAndroid app into a structured datatable? That way, you can track your own sleep using their app, and analyze the data on your own. You should remove weekends from the analysis. You know they are a recurrent repeating event and yet you keep them in all of the analysis. Try a weekend free analysis. Furthermore you should consider cross-correlation and auto-correlation — you’re dealing with timeseries data that is affected by a weekly cycle. Cross correlation and auto-correlation will show you lag effects. Furthermore what you should do is try to model your happiness based on a these variables to better understand the factors. You can also look at the difference or trend in happiness. I don’t know why I should remove the weekends per se for this analysis? It could result in different results but I’d just be focusing in on a specific type of day. This analysis is part 1 in a series, and therefore acts as an overall introduction really. The next step is to dive deeper, and as you say, I’d like to compare workdays vs. days off, or waking up with an alarm vs naturally waking up. Thanks, Anthony! I really appreciate the nice words. “If you have a day of bad sleep (i.e. non-optimally consolidating the day’s events), followed by a day of good sleep, it’s not like your “health bar” is permanently lowered. You’ll just never get to re-consolidate that lost day. So, today I read 20 pages of a book and sleep like crap – I “lose” the synthesis of those 20 pages in my memory/associative brain map/whatever. If I slept better, I’d remember way more from those 20 pages. Given the clear lack of much correlation, wouldn’t it be at least equally likely that extreme unhappiness causes you to sleep less, rather than the other way around? Good question, but I’d like to first mention that a small correlation does not directly mean that it’s insignificant. Given the fact that my happiness is influenced by a virtually endless list of other factors, I’d say it’s pretty impressive that my sleep still has a distinctive influence, especially on the bad days. I’m also tracking my sleep using Sleep as Android, I’m curious to see any “data massaging” code you’ve produced to extract times from the CSV export. I’ve started to work on my own visualisation of sleep data, I hope to get inspired by your approach… do you have anything available online? Sure, I will gladly send you the sheet that I used to parse all the data from Sleep as Android. Give me some time to turn it into something that you should be able to readily use! I will get in touch with you! Highly interesting and love how well you put it together. This sleep & happiness thing is definitely highly interesting. I think you’re right with testing the quality of sleep, too. Sure, it’s difficult, but I guess that’s where the key lies. The 4h sleep experiment sounds cool, too. Go for it! ? Keep up your great work! Really thought-provoking.